RBI SURPRISES THE MARKET, VOLATILITY RETURNS – 23/04/2010. The market started the week on the back-foot but the positive surprise by the RBI gave the market much needed impetus and the financial sector led the market comeback from lower levels. But in the process, the market became very volatile as the bulls and bears slugged it out for want of control. Next week, being the expiry week, the market is likely to become more volatile. The market will also react to results which will be announced over the weekend. RBI MOVE SURPRISES THE MARKET. RIL DISAPPOINTS ON MARGIN FRONT. In its battle against inflation, the RBI hiked key interest rates – Repo, Reverse Repo and the CRR by 25 bps each. This is the third round of rate hike by the RBI in the current calendar year. The much feared monetary policy review turned out to be more benign than expected and it clearly indicates that the RBI is not in a hurry to move ahead of the curve. The RBI is taking more balanced view between downside risk to growth and upside risk to inflation. The market took the policy positively and rallied, led by banking, financial and real estate stocks. The result season had gone smoothly so far without much negative surprises, but the Reliance Industries results, which were announced after the market closed the week on Friday was below street expectations. Net profit came in at Rs. 4,710 crores v/s market expectation of Rs. 5,280 crores. The decline in profit can mainly be attributed to decline in petrochem profit and refining margin. The market will certainly react negatively to lower GRMs which came in at $7.50 /bbl v/s the street expectation of around $9.00 /bbl. 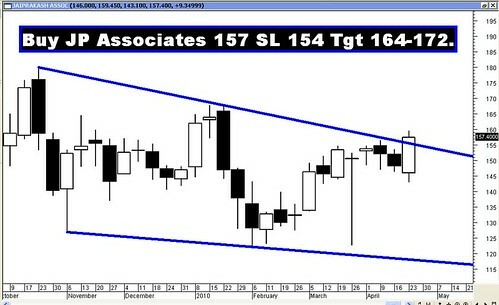 The Sensex opened the week at 17584, made a high of 17778, a low of 17276 and closed the week at 17694. The Sensex gained 103 points on a weekly basis. Similarly Nifty opened the week at 5279, made a high of 5331, a low of 5160 and closed the week at 5304. The Nifty too closed with the week with a gain of 42 points. A Bullish Reversal pattern almost resembling a Hammer can be seen on the weekly charts of both Sensex and Nifty. The weekly candle has long lower shadow and small upper shadow with a small white body. The long lower shadow is indicative of the buying pressure from lower levels. 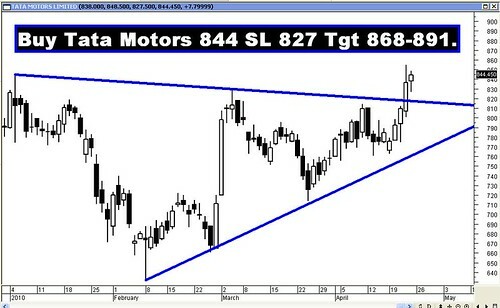 On the daily charts, both Sensex and Nifty have formed a Bullish Opening White Marubuzo. Oscillators like the ROC and the MACD continue to be in Sell mode, but the MACD is still in positive territory. OBV, MFI and RSI have both started moving higher. RSI moved upwards after taking support at 50 and is currently is at 64. The Directional Indicators have given a Buy signal on Thursday, while the ADX is at 27. Both Sensex and Nifty have bounced from 17276 on the Sensex and 5160 on the Nifty. The short term direction of the indices will be up as long as the bottom of 17276-Sensex and 5160-Nifty is held. If these levels are broken, the indices will re-enter short term correction. In that case, the Sensex will correct its rise its rise from 15651-18047 and the correction levels will be 17132-16849-16566. Similarly Nifty will correct its rise from 4675 to 5399 and its correction levels will be 5122-5037-4952. From the medium term point of view, it is necessary that the Sensex holds the support zone of 17061-17027 and Nifty 5101-5092. Sensex has Trendline Resistance at 18204 and Trendline Support at 17337, while Nifty has strong Trendline Support at 5221-5156 and Trendline Resistance at 5417-5491. Nifty OI PCR is quite bullish at 1.57. Strong Call writing is visible at the strike of 5400 for the next month series which will provide some resistance on the way up. Strong Put writing is seen at 5200 strike price, which should provide support in case of a fall. For the week ahead, Sensex will find Support at 17538-17408-17276 and will find Resistance at 17793-17975-18204. For the week ahead, Nifty will find Support at 5269-5221-5160 and will find Resistance at 5331-5368-5417. Those who heeded our advice to trade in pairs, were able to make some profits as can be seen in the table below; as the market turned out to be very volatile.